Kid's have BIG imaginations, but we don't have to tell you that. You already know. You've seen your kid running around in the backyard like a wild one... climbing skyscraper trees, swinging on the swingset like it's an aircraft carrier's runway, digging up ancient treasure out of the sandbox. Of course, that's the fun of play time. It's when kids get to develop their sense of imagination and creativity and fun. So, while they're out there on an important mission to save the last of the sacred unicorns from a ravenous group of zombies, they're going to need a totally fake weapon to help them get the job done. No more empty paper towel tubes "pew-pewing." Now they can really let their imaginations soar with this tactical TOY gun. 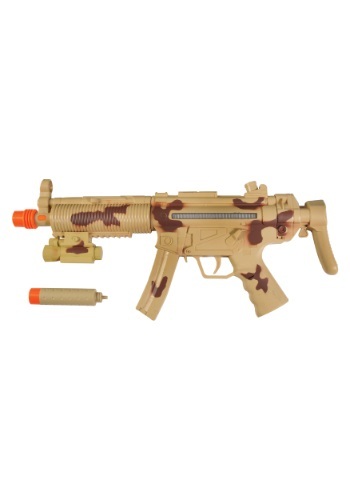 It's got all the sound effects and cool camo design while also being totally safe and easy to spot as a toy with its bright orange-tipped barrel. There are light effects as well! Which makes it great for those long summer nights outside when the sun goes down late.